I spent some more time reading through the journal I found yesterday. 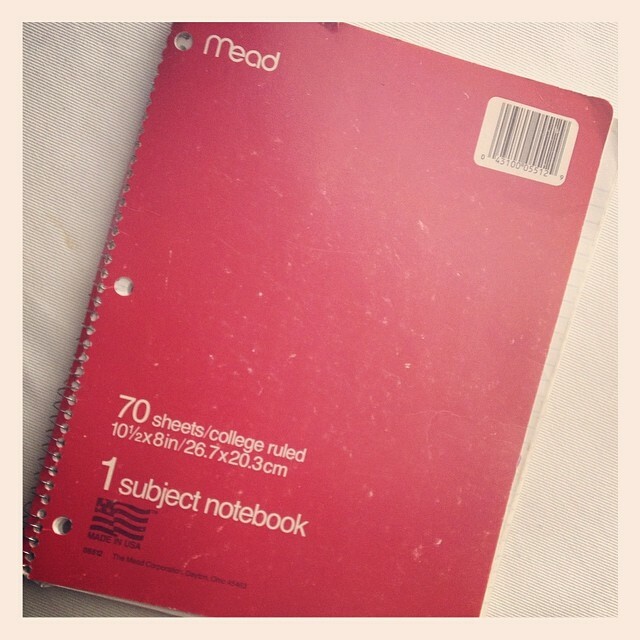 I say “journal” and some might think it was some leather bound volume with carefully lined pages, but really, it’s just a 70-page spiral notebook I wrote in during that time period. The entries begin on September 16, 1993 and end on January 2, 1994. Here’s a very small sampling of excerpts. On September 21, 1993, approximately six months after caving to the pressures of the LDS community in which I lived, I copied Isaiah 49:21 into my journal. A few days later, I copy the verses from Isaiah 49:15-16 into my journal. I have to admit though, I can see why he might have gotten that impression. I did a *very* fine job of hiding the searing pain from every one, and acted well the “part” of the fallen-but-now-redeemed-through-adoption Mormon birth mother. I am left wondering, did anyone in my life at the time see what a hot mess I had become emotionally and spiritually? Did anyone care? Why didn’t my bishop or some other trusted person tell me to get the hell into a counselor’s office STAT? Why was I offered a band-aid for my wounded and suffering heart when what I really needed was CPR? From that point, I begin to really spiral downward into an inky dark place and then the journal ends on January 2, 1994. By virtue of the fact I am writing this today, I know losing my daughter to adoption didn’t kill me entirely, though it came very close to doing so. Somehow, by sheer determination and grit, I was eventually able to dig myself out of the deep depression adoption had brought into my life. If adoption taught me anything, it is that I am far more resilient and tougher than I ever imagined I could be. There is much more in those 70 pages I have not shared here – so much more, but I think this is a pretty representative sample of my state of emotion and mind at the time. In case anyone ever wonders if this was ever “easy” for me or if I ever felt “good” about my “choice,” the answer is right here in my journal. It hasn’t been easy and I have never felt “good” about it, regardless of what carefully-crafted mask I have presented to the world. Am I resigned to my loss? Yes. Accepting of my reality? Yes. Hopeful to find healing? Yes. But do I feel “good” about losing my daughter this way? No. Not for one moment since she left my arms in 1993. This entry was posted in Uncategorized by Melynda. Bookmark the permalink. Melynda tells it how it was for her to give up her child for adoption….. Thank you for sharing this, Von. It is difficult stuff to share and I know it makes some *very* uncomfortable, but the truth has to come out. So much pain. I’m sorry. Thank you for your kind words. I was in acute pain back then, most certainly. Fortunately, time (and maturity) have helped me manage the pain from losing her. This post makes my heart hurt for you ~ for all of us moms of adoption loss. I wish that all moms considering adoption could read these words and KNOW the painful truth behind them. I know, Susie, but I wonder if they would listen. They seem to know it all and believe we are just “bitter” and “angry” because of our “bad” experience.